In the summer of 2005 I was privileged to work with an incredibly talented cast of artists in the final season at my Summer Theatre in MA, Acting Up Theatre Company. Many of these performers are now traveling the country in National Tours and appearing on Broadway. 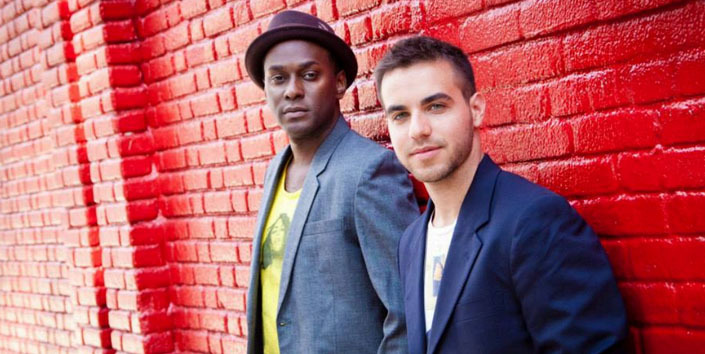 In 2013, fellow AUTC alum Douglas Lyons joined forces with musician Ethan Pakchar and magic was born. Lyons and Pakchar’s collaboration began when they met touring on The 1st National Tour of The Book of Mormon. Douglas Lyons an actor onstage and Ethan Pakchar a guitarist in the pit. What began as a friendship bloomed into writing sessions in hotels, dressing rooms and theatre’s around the country. In August 2013, after fundraising a campaign, the team recorded their debut album #Love (Live) at The Cutting Room in NYC. “#Love(Live) an 11-song album that mixes pop, R&B and theatre to explore “the good, bad and awkward roller coasters in human relationships.” L & P celebrated the release of their album at Rockwood Music Hall and most recently delivered a sold-out concert entitled “The Songs of Lyons & Pakchar”at 54 Below. Currently the duo is diligently writing two new musicals.